San Francisco (CNN) It’s so hot in the West that the scorching heat is breaking records, causing massive power outages and prompting flight cancellations. On Tuesday, Phoenix hit a daily record reaching 119 degrees Fahrenheit, which ranked as the fourth hottest day on record for the Arizona city. 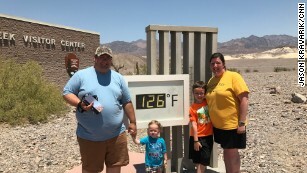 Death Valley, California, lived up to its name as it set a daily record at a high of 127 degrees, according to the National Weather Service. Las Vegas was also scorching and tied an all-time record high at 117 degrees Fahrenheit on Tuesday. Excessive heat warnings have been issued for inland California, southern Nevada and parts of southwest Arizona until Friday. More than 29 million residents in California are under a heat warning or advisory. The heat wave was already affecting travel in Phoenix, American Airlines canceled 43 flights Tuesday to and from Phoenix Sky Harbor Airport due to extreme heat, the airline said. There could be more cancellations later Tuesday, an airline spokesman said. Seven flights were canceled due to weather on Monday, when the temperature reached 118 degrees, rounding out the total to 50 weather-related cancellations in two days. Some smaller regional jets cannot take off in temperatures hotter than 117 degrees, it said in a statement. “Our smaller regional operations — those that use our CRJ aircraft types — will be most affected by the heat,” the airline’s communication specialist Kent Powell told CNN. “We really aren’t expecting any change to the operation with our mainline aircraft.” Because hotter air is thinner, planes also need more speed to take off and, thus, require more runway. Sky Harbor’s runways are long enough to accommodate most planes in hot weather, American Airlines said. In Phoenix, the 118 degrees on Monday tied the record set exactly a year ago. Today’s high of 118F in #Phoenix ties the record set 1 year ago. If we hit our forecast highs Tue & Wed it would set 2 new records. On Sunday, several Northern California cities — including Sacramento (106 degrees), San Jose (103 degrees) and San Francisco (88 degrees) — saw record hot temperatures. 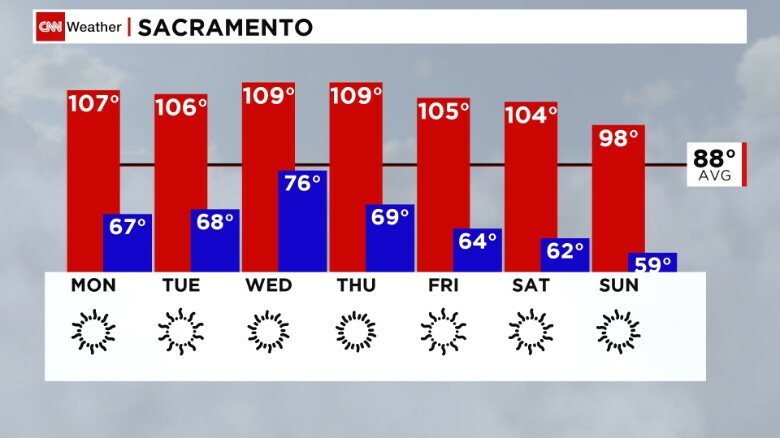 The record-breaking continued Monday with Sacramento hitting 107 degrees, a step hotter than its 106-degree record from 1988. It could get even hotter on Wednesday, with a forecast temperature of 109 degrees. High temperatures looking to surpass the new record of 106 degrees on Sunday. — On Monday, Stockton, California, saw a record high of 109 degrees and Lancaster in southern part of the state had 110 degrees. ‘This is on another level’: They came, they camped, they baked at Death Valley. Firefighters across California are battling several fires, including one near Big Bear spreading to 950 acres. They dealt with a grass fire in Sacramento that broke out during Monday’s evening commute. Cal Fire warned of high fire danger with hot and dry conditions. Power outages have been reported over the last few days in California’s Central Valley, the Bay Area and southern parts of the state. As temperatures increase, more people turn on air conditioners, which use a lot of electricity and can strain the power system. The heat could’ve been a factor as four lanes of Highway 50 in West Sacramento began to buckle on Sunday. Drivers reported the giant cracks forming on the road and the lanes were repaired, reported CNN affiliate KGO. What it actually feels like outside when you take into account the humidity and high temperature. Heat kills more people in the United States than any other type of weather, so take precautions. Never leave your car locked or unattended without checking for pets and children inside. Hydrate with water, avoiding sugary drinks and alcohol. Wear light-colored clothing, which can hold down your body temperature several degrees. Wear sunscreen SPF 15 or higher to protect your skin from harmful UV rays. 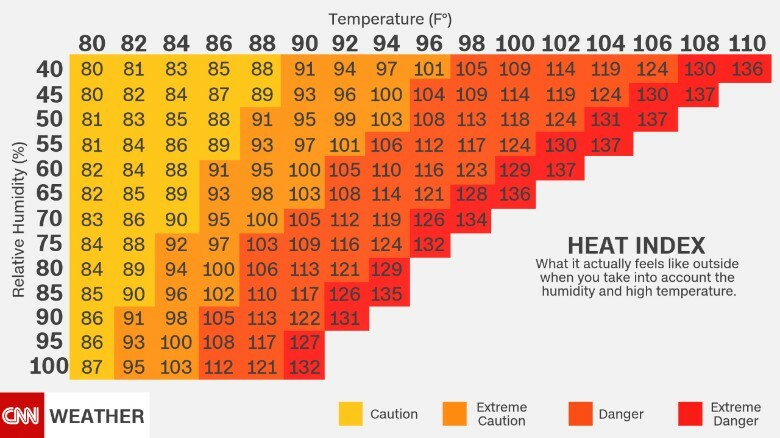 Don’t forget to check on neighbors, friends and family, especially the young and the elderly, who are at more risk of heath damage from excessive heat. CNN’s Keith Allen, Ann Rodden, Dave Alsup and Darran Simon contributed to this report.